Baseball fanatics won't have to leave behind their beloved teams when they finally go to that big stadium in the sky. Instead, they'll soon be able to rest in peace inside a coffin with team colors and insignia. Major League Baseball has a marketing deal with a company called Eternal Image to put team logos on caskets and urns. The effort begins next season with the Yankees, Red Sox, Tigers, Phillies, Cubs and Dodgers. It could eventually include all 30 teams. After starting with baseball, Eternal Image hopes to branch out by making similar deals with the NFL, the NHL and NASCAR. "We have been receiving these requests either directly or through our clubs for several years," said Susan Goodenow, an MLB spokeswoman. "Passionate fans express their love of their team in a number of different ways." The National Funeral Directors Association is meeting in Philadelphia this week and giving its members a sneak peak of what the urns will look like. Eternal Image says urns for the six teams should be available by Opening Day 2007, and caskets for those teams should be ready later in the year. The products have not been made yet, and the exact cost has not been set. Kurt Soffe, a spokesman for the funeral association, said the MLB caskets are part of a trend of trying to capture "the life and the passions of the person that has passed away." At this year's convention, for instance, there was a Harley Davidson-themed casket and one featuring Betty Boop. "More and more families are wanting to have something that respects the personalities," Soffe said. Farmington Hills, Mich.-based Eternal Image, which also makes a line of Vatican-themed products, "wanted to break into a sports venue of some kind," said Clint Mytych, the company's CEO. "It is the all-American sport." He said he has gotten at least 1,000 inquiries since June. 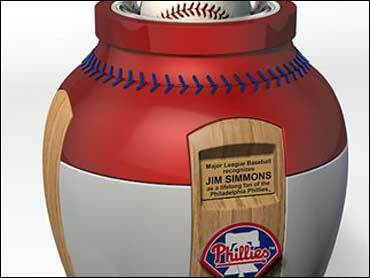 The Phillies urn was the first of the MLB products to be designed. Each urn will feature recognition of the deceased's passionate support, stamped with a message that says "Major League Baseball officially recognizes (person's name) as a lifelong fan of (team)." The league, the manufacturer and funeral directors are trying to fill a need with the products. But they acknowledge that the sales will have to be done with respect, like all transactions in the sensitive world of funerals and burials. David Griffin, funeral director at L.J. Griffin Funeral Home in suburban Detroit, said fans in many blue-collar cities have undying loyalty to their teams, which could make the MLB caskets and urns a hot commodity. "Looking at it as a consumer, I was thinking this is some pretty interesting, unique stuff," Griffin said. Nevertheless, funeral homes will have to be very careful so as not to offend their clients, many of whom will surely be scared off by the idea. "They are a little bit hesitant because of what others might think," Soffe said. The manufacturer also will have to make sure the products aren't too expensive. People who opt for cremation, for example, often do so partly because it is cheaper. "I guess it's going to be interesting to see how it's accepted," Griffin said.